Miley Cyrus bedding Harry Styles? Miley Cyrus has decided to confirm that the cheeky photos of herself and a Harry Styles cardboard cut-out were just for fun and not a profession of love for the famous boy bander. This gal is all kinds of funny, no? 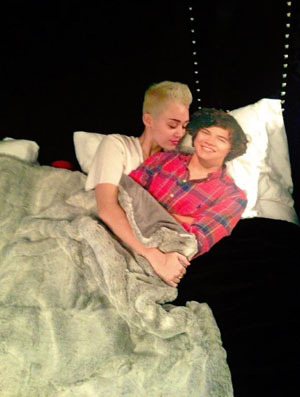 In the wake of the Taylor Swift–Harry Styles breakup rumours, Miley Cyrus has tweeted several photos of herself snuggling with a cardboard cut-out of the One Directioner, but she wants you to know that she’s only kidding! “In no way do I want Harry. No offense. I’m sure that’ll be a story now 2. I’m happily engaged. Just got saucy with a cardboard cut out,” the singer tweeted. There you have it… No love drama here, folks. Opinions? Miley Cyrus shows off new short do!